Ghost and Blurred Grey Gratitude Wraps are coming according to a product alert email I just received! "Amagad! Upload Thursday Armageddon Eve"
and I'm assuming they will only be released to Canada. 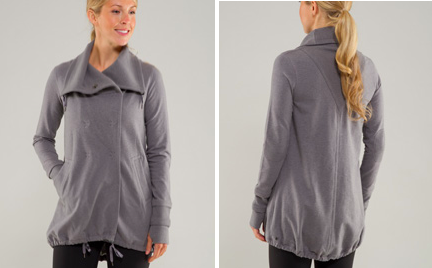 I am one angry lulu shopper. I wish they would upload all of those colors today which would make several chances to get one. Yuck. I don't like these at all and i do NOT see what the big deal is. They make everyone's hips/thighs look huge they way they gather at the bottom. they remind me of a pumpkin halloween costume my mom wore when she was pregnant. I thought I liked them at first, but I keep seeing photos of it with the drawstring pulled in, and its really ruining it for me. I prefer the method wrap for sure. I agree! 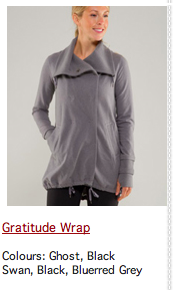 I hadn't seen a gratitude wrap before (but had heard of it being sold for $400 on ebay!). When the produce notification for my local store showed it I thought it was a bit frumpy. That's good to know. I rushed to Coquitlam on Monday to get a Black GW and then logged onto Lulu early this morning and had Black Swan in my basket and thought about it and thought about it…do you really need 2 so similar in colour and sadly decided "NO". Then I saw this and thought I made the right decision I prefer a totally different colour. Any ideas when the colours are coming in? Were the grey and ghost from a Canadian product notification?